My first big-stage keynote address was this week at the Enterprise 2.0 conference. I had the enormous pleasure to introduce Tyler Knowlton and his story about how purpose helped him and his team change how the G20 prepared and organized their summit meetings. It was an intimidating but thrilling experience that was made wonderful by Steve and Paige at the E20 conference, several of the other speakers, including Ross Mayfield – who is very warm and imaginative in person – many of my twitter friends with their kind tweets and comments, and especially by the kind, humble, and very wise Tyler Knowlton. Of my co-workers, only Kim Edwards actually made it in person. So for the rest, I am posting the text of my remarks. “People are our greatest asset”. For decades right-thinking executives have repeated this phrase with varying levels of sincerity. In the last couple of years, however, we’ve learned that this “people first” concept is not exactly true. We are in the midst of a huge paradigm shift from a mechanistic ideal of organizations to a humanistic one. From the traditional notion of the ideal company as a well-oiled machine, controlled by a CEO, to one where the ideal company is a synthesis of minds that is constantly and continually learning, improving and producing. We’re not all at the same point along the path of this transition – and even within organizations, some people are further along than others. You guys here are in the lead, of course. And, in the midst of this new-found humanism it is tempting to embrace the “its our people” mantra ever more tightly. That’s because we’ve discovered that we have vast untapped human potential hiding within our organizations, and the pressure to figure out how to engage it is skyrocketing. You’ll hear a lot about how to engage people here this week, and with good reason. But we’ve been out there for a couple of years or so building and selling an enterprise social app that supports team collaboration, and our research and, even more, our customers and also many of you, have taught us a lot. We’ve learned that we can predict with close to 100% accuracy which of our clients will fail and which will succeed. There is a single criterion that we can use to predict this and it is a sense of purpose. Without a strong sense of purpose, even the most talented collection of people will founder. With a sense of purpose you will get the best work out of whatever crew you have assembled. With purpose, people strive. Without purpose, personal interests, infighting, and worse, apathy, takes the place of vision, and becomes the dominant force in decision-making. With Purpose, people strive. Their iron cores align to a common magnetic north. This alignment unlocks their collaborative, collective potential. Personal politics – though still there – takes a back seat. We have been so inspired by the people we’ve met and what they have taught us, that we thought the best thing we could do to serve our purpose (which is to help you pursue yours) was to expand access to some of this great thinking and work beyond our team and even this community. We think you’ll soon agree with us – with me – that it is in fact your purpose that is your greatest asset. Today I’m adding this: In celebration of the 2.0 release of social workplace, we are sponsoring a prize for the organization that has shown dedication and innovation to the pursuit and achievement of purpose. The prize will consist of $10K to the charity of the winner’s choice. The winner to be judged by the speakers in our series. Come find me, my teammates, our booth, or our website. 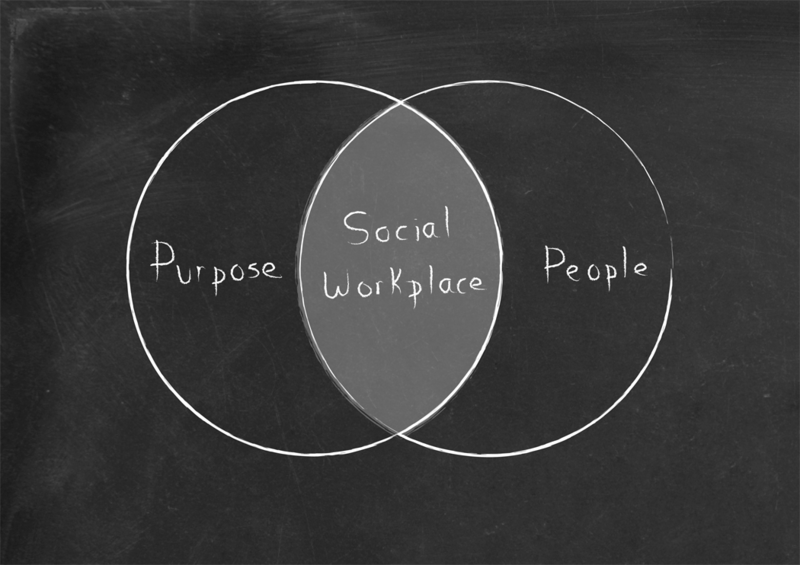 Tell us your stories about the role that purpose plays in your organization. So. We’re going to kickoff this speaker series right here and now. Allow me to introduce one of those clients who taught us a lot. Tyler Knowlton is the Chief Strategy Officer in the Office of innovation at the Canadian Department of Foreign Affairs and International Trade. He was one of the guys behind the Virtual G20 – which was designed to reduce the frustration and increase the impact of some people doing a difficult job. I think you’ll find his story very interesting for its simplicity and its power. It all started because the Canadian delegate got frustrated with his email….